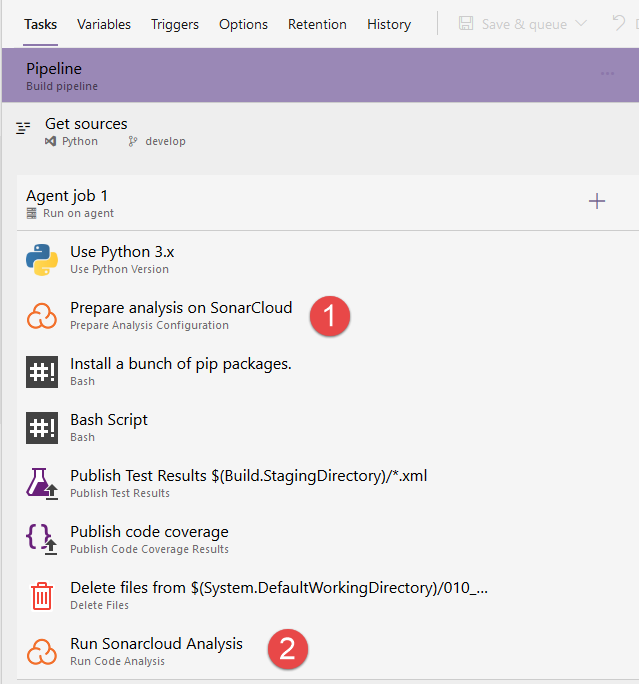 Running a SonarQube analysis for TFS or VSTS is really easy because we can use a pre-made build tasks that requires few parameters and the game is done. 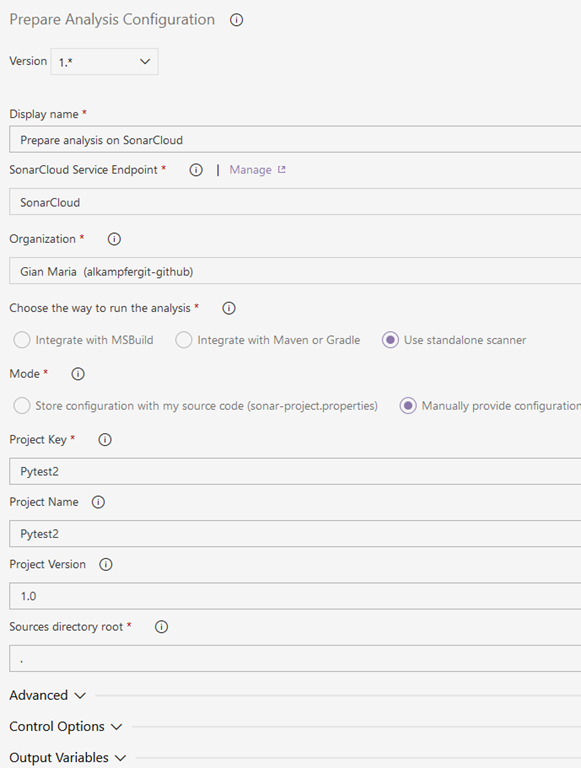 If you have open source project it made lot of sense to use a public account in SonarCloud, so you do not need to maintain a sonar server on-premise and you can also share your public account with the community. For open source projects, SonarCloud is available for you with zero effort and thanks to VSTS and TFS you can automate the analysis with few steps. The first step is creating an organization in Sonar Cloud, if you prefer you can just login with your GitHub account and everything is ready. After the creation of the organization, you should create new project and generate a key to send analysis to SonarCloud server, everything is made with a simple wizard and it takes only a bunch of seconds to have your project created and ready to be used. Once you have your project key and token you need to add the endpoint of SonarCloud to the list of available endpoints. 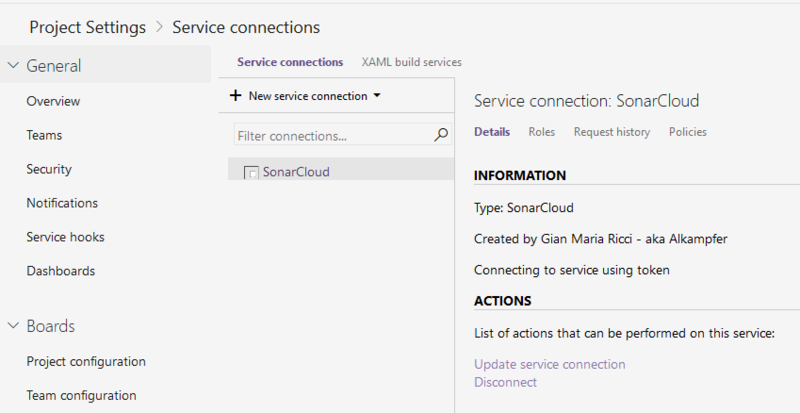 You only need to give the connection a name, specify https://sonarcloud.it as Server Url and add the token generated during project creation. Now you can configure build to perform the analysis, the first task is the “prepare analysis Task”, as you can see in Figure 2. You should select the Endpoint created in previous step, fill the project key and project name, but you need also to specify a couple of properties in the advanced section . The first one is sonar.organization and it is required or the analysis will fail. This is the only difference from on-premise SonarQube server, where you do not need to add organization name. Figure 2: Configuration of the prepare analysis task. 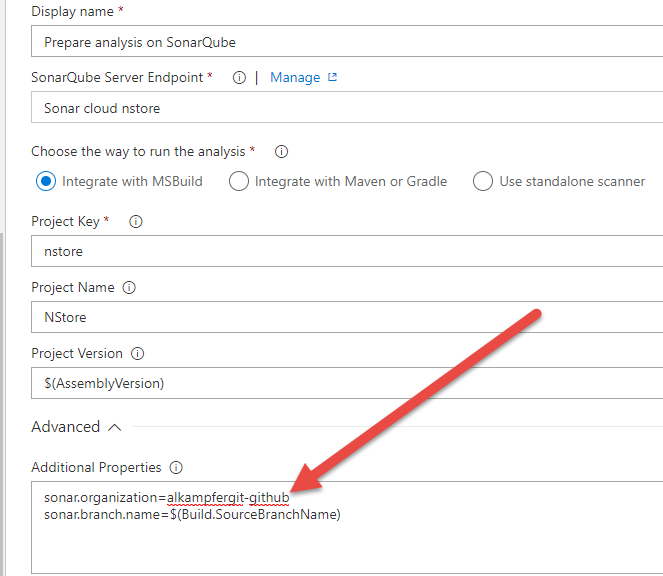 The other setting to be specified in Additional Properties is the sonar.branch.name, to perform branch based analysis, a feature that is available in sonarcloud and it is available on-premise only with enterprise version. You can simply use the $(Build.SourceBranchName) to use the current branch if you are using Git. Figure 3: Analysis performed on NStore project with branch analysis enabled. The cool part of the process is that, SonarCloud require zero installation time and less than one minute to create the first project and thanks to the VSTS / TFS build engine you can automate the analysis in less than 2 minutes. Creating a build that is capable of perform a SonarQube analysis on a VSTS / TFS is a really simple task, thanks to the two tasks that are present out-of-the box. The problem in a project that was alive for more than a couple of years is that you usually have a really bad report when you do your first analysis. This happens because, without a constant analysis, the code have surely some smells. Sometimes you get really discouraged, because the number of issue is really high, but before losing any hope, check if the errors are really part of your code. In a project where I’m working, we got really bad numbers and I was 100% sure that it is not a problem of our code. When you analyze your project for the first time, sometimes the number of issue is so high that you really are discouraged. Before giving up, check if the errors are really part of your code. To diagnostic the problem, simply login to the project, then go to Code view (something like http://build:9000/code/?id=projectName), then you will see a summary of all the bugs, but unfortunately you cannot order for the number of the bug, so Just scroll down to see the part of the code with the most errors. In your situation the vast majority of errors comes from the angular library, from all the script of the skin we use and for third party libraries stored under the /app/scripts/lib folder. After exclusion, the number of bugs dropped from almost 7k to 500. 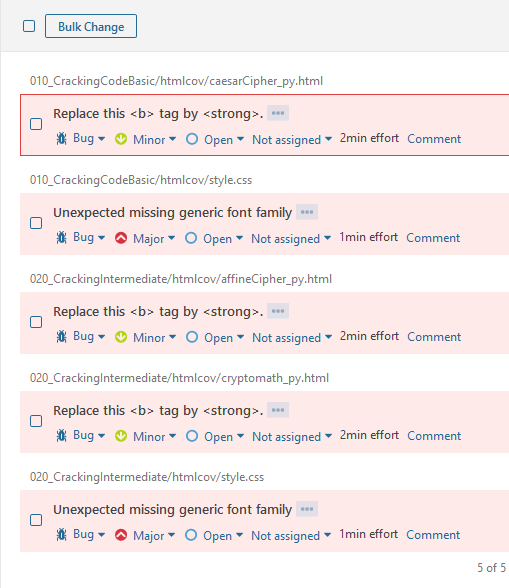 I’ve upgraded a SonarQube instance, and then, suddently I realyze that some builds start failing due to to a strange error in the SonarQube complete analysis task. Invalid character encountered in file C:\vso\_work\3\s\src\Jarvis.ConfigurationService.Client.CastleIntegration\Properties\AssemblyInfo.cs at line 25 for encoding UTF-8. Please fix file content or configure the encoding to be used using property 'sonar.sourceEncoding'. This is really annoying, but actually I start investigating the error logging to the build server and checking the file that generates the error. When you have strange encoding erorr I strongly suggested you to visualize the file with some Hex editor, and not a standard editor. I immediately realized that the error is due to my GitVersion task script, because it manipulates assemblyinfo.cs files to change version numbers and save back the assemblyinfo.cs in UTF-16 encoding. If you do not know Byte Order Mark I strongly suggest you to take a look in wikipedia, because this is an important concepts for Unicode files. I immediately checked with an hex editor, and verified that the original assemblyinfo.cs has a BOM for UTF-8 but the PowerShell script modified it converting to UTF-16 but the BOM is correct. The annoying stuff is that the build worked perfectly until I updated SonarQube (server + analyzers) this means that for some reason, the most recent version of Sonar somewhat does not check the BOM to understand file encoding. I’ve solved the problem simply changing the Set-Content call to force UTF8 and the problem is gone. I really like SonarQube, but you should always verify that everything works after every upgrade. SonarQube is a really nice software, but for what I experienced it does not play well with Sql Server. Even if Sql Server is fully supported, there are always some little problem in setting everything up, and this is probably due to the fact that most of the people using SonarQube are using MySql as Database Engine. Figure1: Databse error during upgrade. Remember that SonarQube upgrade procedure does not have a rollback procedure, so it is mandatory that you take a full backup of the system before performing the upgrade. 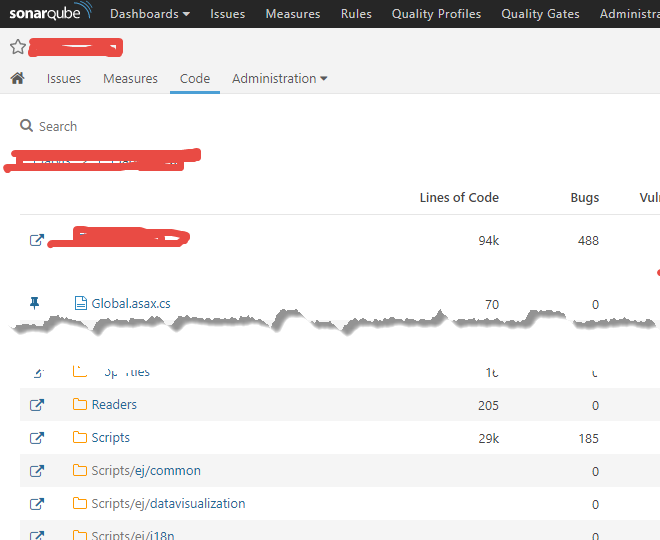 From what I’ve learned in previous situation, whenever something does not work in SonarQube, you need to look at the log. The above error message is really misleading, because it seems that there were some connection problems. Reading the log I discovered that the error is really different. com.microsoft.sqlserver.jdbc.SQLServerException: Cannot resolve the collation conflict between "SQL_Latin1_General_CP1_CS_AS" and "Latin1_General_CS_AS" in the equal to operation. Whenever you have problem with SonarQube do not forget to read the log, because only in the log you can understand the real cause of errors. 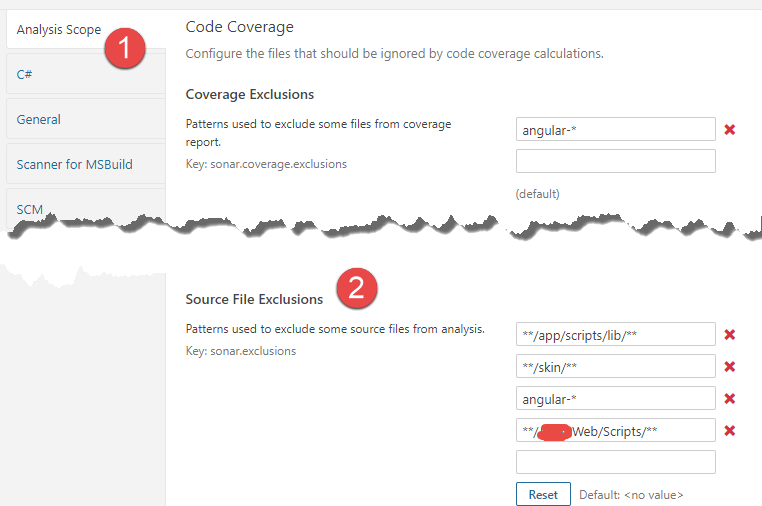 Collation problem are quite common with SonarQube, documentation is somewhat not correct, because it tell you that you need to use an Accent and Case sensitive collation, but does not specify the collation. My SonarQube 5.1 instance worked perfectly with SQL_Latin1_General_CP1_CS_AS, but sadly enough, script to upgrade db to version 6.0 fails because it is expecting Latin1_General_CS_AS. If you install SonarQube with Sql Server, it is better to chose Latin1_General_CS_AS as collation to avoid problems. Luckly enough you can change database collation for an existing database, the only caveat is that you need to set the database in Single User Mode to perform this operation. Clearly you should have a backup of your database before the migration, or you will end with a corrupted database and nothing to do. So I restored the database from the backup, run the above script, restart SonarQube and try to perform the upgrade again. My instance is now running 6.0 version.